Celebrating the life of John Arthur Noonan, Jr.
Obituary for John Arthur Noonan, Jr.
John Arthur Noonan, Jr. passed from this life at the young age of 75 on January 26, 2019. John served this great country from 1962-1965 with the United States Army. On June 13, 1965, he married Linda Watson and to this union three children were born. 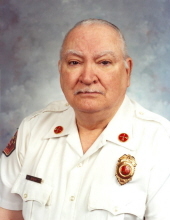 He served his community of Rolla, MO for 29 years from 1967-1996 with the Rolla Fire and Rescue Dept. as a Captain. John is preceded in death by his parents, John Noonan, Sr. and Kathleen (Frankum) Noonan of Grandview, MO; his in-laws, Clarence and Emily Watson and a sister-in-law, Lois Jaquess of Rolla. John is survived by his wife, Linda Noonan of the home of 53 years; one son, Mark Noonan and wife Carrie of Rolla, two daughters, Cindy Catrina and husband Bryan of Arlington, TX and Cheri Sieber-Johnson and husband Aaron of St. James, MO; a brother, David Noonan and wife Julie of Peculiar, MO; six grandchildren; six great grandchildren; and a host of nieces, nephews, and extended family and friends. A funeral service for John A. Noonan, Jr. will be conducted at 11 a.m. on Thursday, January 31, 2019 at the Null and Son Funeral Home of Rolla. Interment with military honors will follow in the Beaver Creek Cemetery. A visitation for family and friends will be held from 6-8 p.m. on Wednesday, January 30 at the funeral home. Pallbearers will be members of the Rolla Fire and Rescue Dept. Honorary pallbearers are all retirees of Rolla City Fire and Rescue Dept. To send flowers or a remembrance gift to the family of John Arthur Noonan, Jr., please visit our Tribute Store. "Email Address" would like to share the life celebration of John Arthur Noonan, Jr.. Click on the "link" to go to share a favorite memory or leave a condolence message for the family.